Alas, we made it. Grandparents were very happy to see us. Blue sky and summer sunshine greeted us. A splendid holiday awaited us. In short, Germany at its best. We are so lucky. 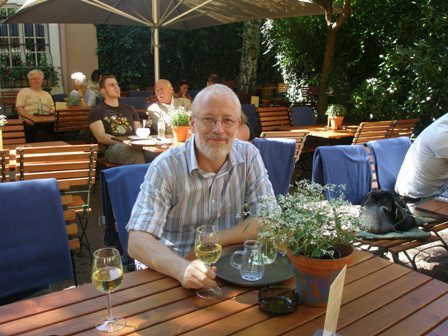 Margit and I, we went to check out our favourite “watering whole”: the wine bar of Reichsgraf von Kesselstatt opposite the cathedral and the church of “Liebfrauen”. Riesling was our choice. We had a ‘2007 Kaseler Riesling dry’ (subregion: Ruwer) and a ‘2007 Wiltinger Riesling dry’ (subregion: Saar). Both wines were young and fresh, which make them a delicious drink in a hot summers day. We both preferred the wine from Wiltingen, Saar. Cheers, and “zum Wohl” as the Germans say. PS: I am loading this up from a small flat in Madrid which we rented. The internet connection is weak and blogging difficult. Please bear with me. We are on our way to Europe, having a break at Singapore Airport. Its a great place for spendind a couple of hours before “jumping” from Asia to Europe. 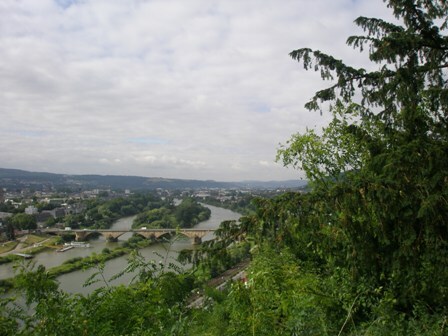 There the Mosel is waiting for us, and we will spend a couple of days with my mother in Trier before moving on to Franconia for another family visit. I hear a whisper: wine, wine, wine, delicious wine! 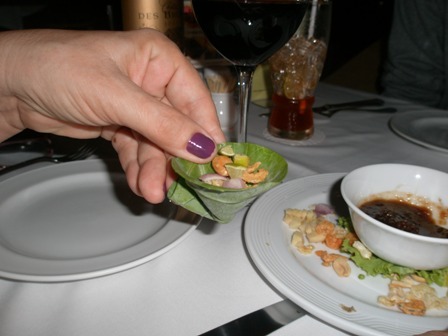 It is not just the grape wine bottles which we are drinking up before moving to Bangkok. 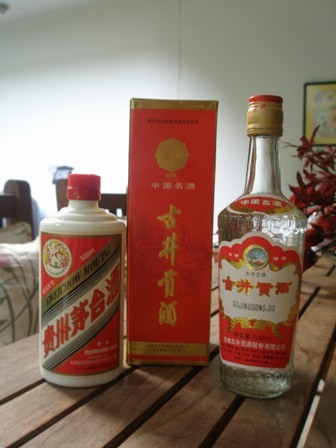 I have a small collection of exquisite Chinese liquors given to me over the years by Chinese and Taiwanese friends. The sorghum based spirits are wonderful though Western people often have difficulties appreciating the scent (some say it smells, well it does: of Sorghum of course). The Shandong liquor was smooth as silk. 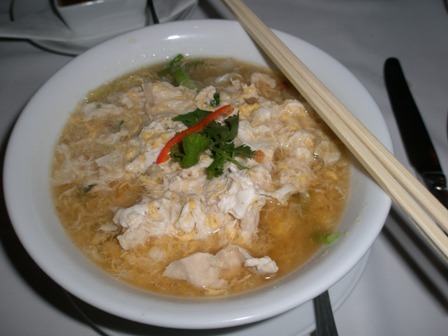 For ‘Gu Jing Gong Jiu’ you need to be in a youngish suicidal mode and not afraid of headaches. 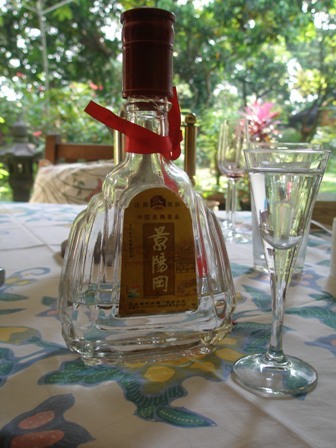 ‘Maotai’, if it is the real stuff, is not only expensive, but a very nice drink. 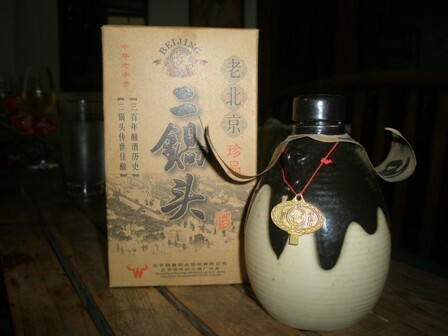 During my time in Beijing we drank a lot of rough ‘Er Gou Jiu’, but the bottle below is a ‘de luxe’ version. Unfortunately, the bottles cannot come to Bangkok, so we enjoy them now. Soon our reserves will be gone and we can start anew to collect them. Thanks god that I have so many friends in Mainland China and Taiwan. My garden is my treasure, as you probably know. We were very lucky to have such a splendid place for so long. 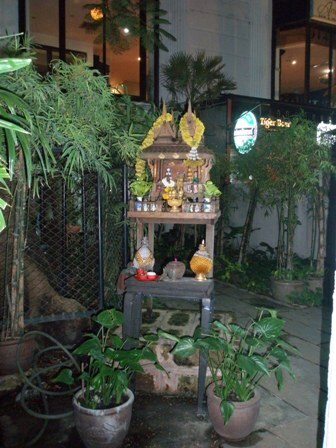 Living in Asian capital cities finds garden enthusiasts like me often in dire straits as far as nature is concerned. 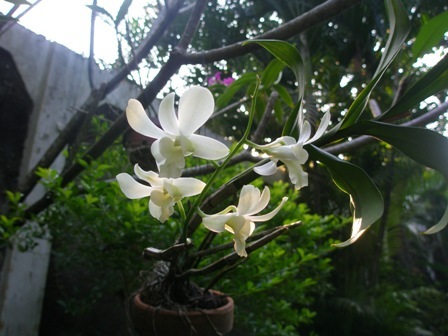 Most of my orchids were passed on to me by my friend Peter Hagen before he and his family left Indonesian after many years. I will pass them on to a friend as well. 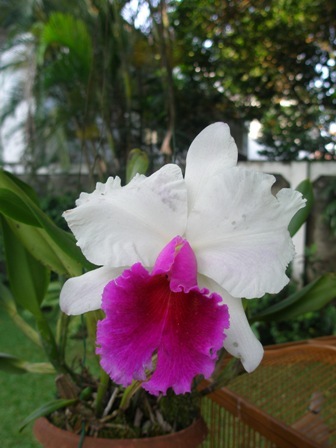 The other day another one of my orchids, an orchid which was not very generous with blooming in the past, bloomed. Wandering about the garden, I wondered if the plant knew that I am leaving soon. 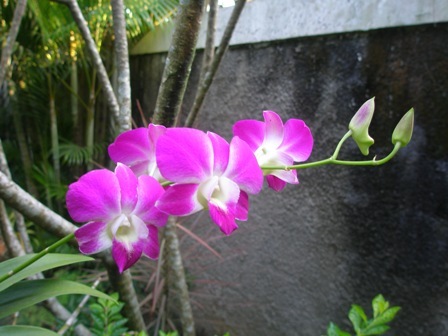 I know of course that the onset of the dry season is also the season for many orchids to bloom. But a nicer good-bye I could not have imagined. 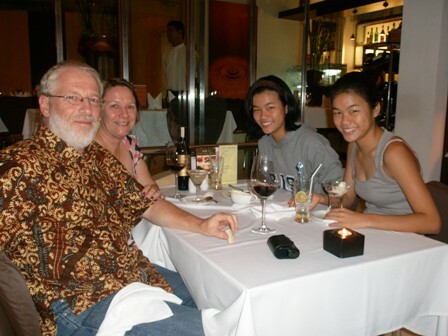 Our last 60 days in Jakarta have started. Soon we will be moving to Bangkok. We try to enjoy every day. Apart from sorting out things, we are spending our time at home with family meals and drinks. ‘2002 Léon Baur Gewürztraminer Grand Cru Pfersigberg’, alc. 13.5 % Vol. ‘2003 Wiltinger Gottesfuss, Riesling Kabinett Feinherb, Reichsgraf von Kesselstatt’ , alc. 11 % Vol. 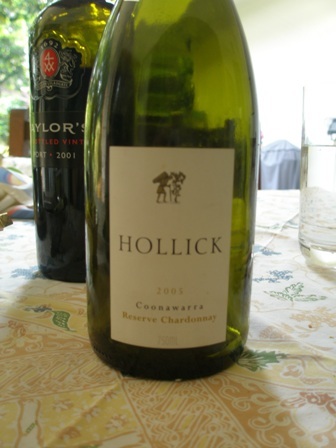 ‘2005 Hollick Coonawarra Reserve Chardonnay’, alc. 13.5% Vol. 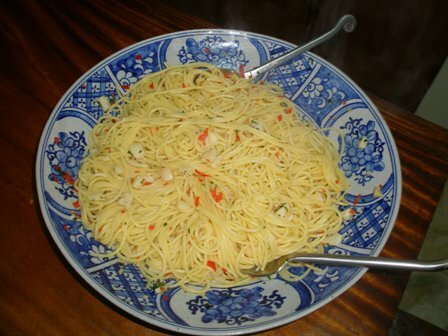 We had it with a seafood pasta. What a delicious Chardy this was. Although cellaring for up to 7 years is recommended, the bottle did not last that long. 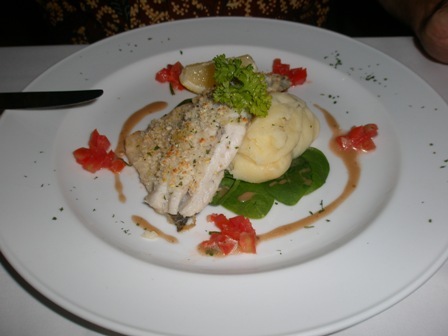 It displayed aromas of white peach, had crisp acidity and balanced creamy overtones. Though the wine was matured in French oak for 10 month, it was not “over-wooded”. Beautiful (www.hollick.com). ‘1999 Mildara Coonawarra Cabernet Sauvignon’, alc. 13.5% Vol. The Mildara brand belongs to the Fosters Group (www.fosters.com). Liz and Walter brought it with them and we had it with all kinds of cheeses, salamis, coleslaw, salads and all kinds of “nibblies”. Despite its age, it displayed all the freshness of a typical Coonawarra wine. The colour was a deep purple. The intense aromas ranged from cassis, to dark berries and plum with hints of mint and herbs. The 18 months in oak have given the wine great depth and bony tannins, mellowed by age. The wine had an excellent structure. It was well aged. ‘2004 Knappstein Clare Valley Enterprise Vineyard Cabernet Sauvignon’, alc. 14.5% Vol. 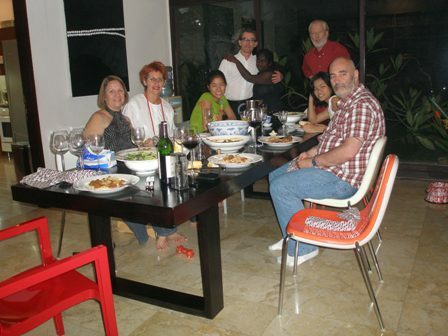 The farewell dinner with our Australian friends (Brett, Janie, John and Dhanya) last night was a delight. We drank some very good wines. I only mention them in passing. Hope you don’t mind. We started with a pre-dinner drink, a ‘2006 Vasse Felix, classic dry white’ from Margaret River, Western Australia. 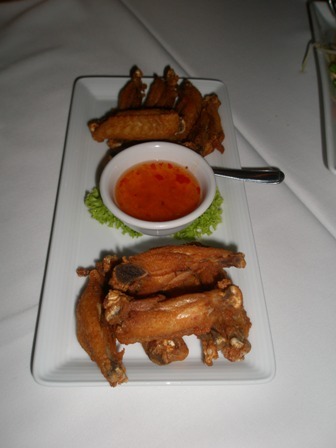 The entreés we washed down with a ‘2007 Yarra Burn Sauvignon Blanc Semillon’ from the Yarra Valley, Victoria. We switched to red before the main course (a pasta bolognese), first to a ‘2004 Cape Mentelle Cabernet Merlot’ and then a ‘2003 Vasse Felix, classic dry red’. Three Margaret River wines stood against the cool climate SB form the Yarra Valley. It was a wonderful evening. No sadness was to find only the joy of being together and having a good time. I love this Australian attitude to life. Winter in Victoria is usually a very nice time, not too cold but has many days with beautiful blue sky and sunshine. It always reminds me of an Irish summer. In the vineyard we are busy pruning , of course. 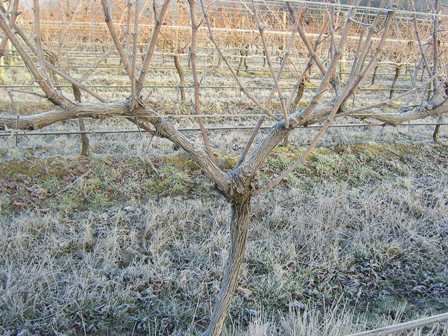 The vines below are awaiting the pruners. 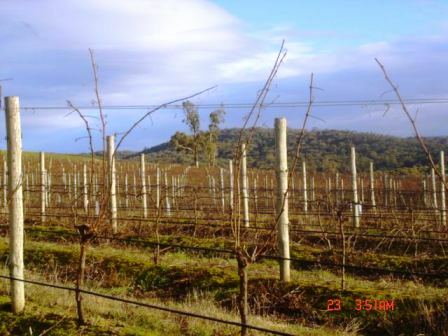 Our professional association, the Upper Goulburn Winegrowers Association advertised recently a pruning course (www.uppergoulburnwine.org.au). This reminded me of the virtual-pruning tool of the German University of Hohenheim near Stuttgart. From time to time I play with it to somehow make up for not being in the vineyard this time of the year. Its in German, but I am sure you will master it. Its strait forward. Check out the link below and prune your heart out. Have fun. 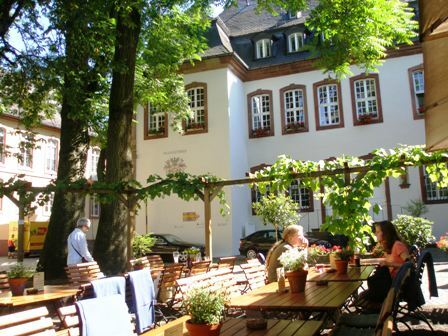 You are currently browsing the The Man from Mosel River blog archives for July, 2008.